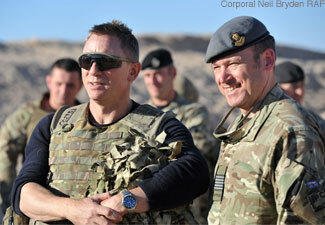 He’s more used to stepping out in those stylish suits or those swimming trunks, but 007 himself – well, actor Daniel Craig – put on a flak jacket recently to visit British troops in Afghanistan. Daniel, 44, visited Camp Bastion to introduce a special screening of the latest Bond film, Skyfall, which has been announced as the highest-grossing James Bond movie of all time. Daniel also got a tour of the camp in an armoured car, met staff and patients at the camp hospital, watched soldiers in training and even tried his hand at detecting mines. ‘We get quite a lot of visitors here but having James Bond was special,’ says Warrant Officer Class One Rob Ingham, who drove Daniel around the camp.